It's nice to have Liz back with some new designs. We have been working on these for a while now, and deliberately went smaller than her previous releases, which allows for all kinds of small format cards. However, you will see how Liz often grows a flower into a larger bouquet with ease, or even taller and wider too. 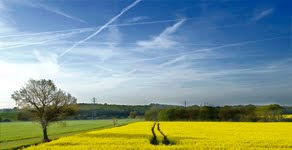 So I'm sure you will find these very versatile, and there are certainly plenty of combinations to choose from. 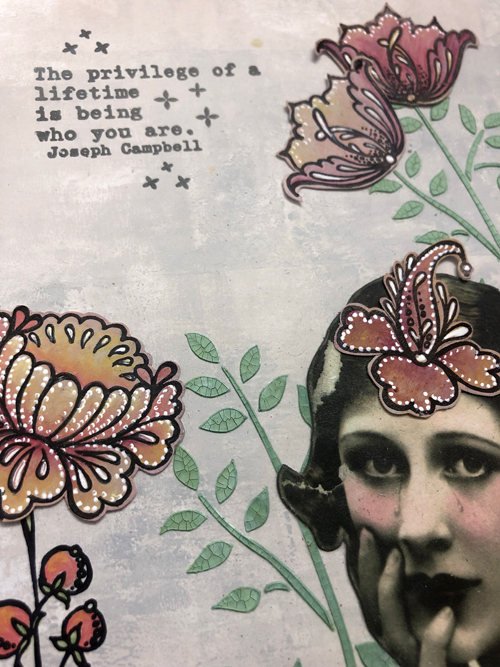 I'm here today to introduce my two new sets of stamps that PaperArtsy have produced. 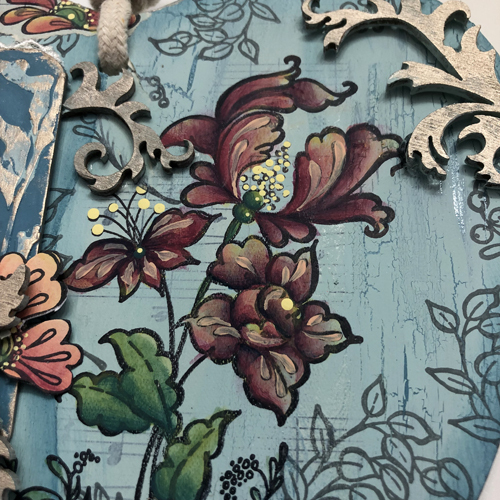 I have mentioned in previous blogs that I love colour and painting and these stamps are inspired by my love of Decorative Painting which I studied for a long time and still enjoy. It is very interesting that although there are many styles of decorative painting designs around the world that are easily identified as coming from particular countries, the basic shapes that form the designs are the same. For example the comma shape. I also discovered while studying these designs that similar shapes and styles appear in other forms of artwork such as Jacobean embroidery. These designs form the basis for a huge range of floral and flourish shapes that can be treated very simply or coloured and used to create rich and beautiful pieces. 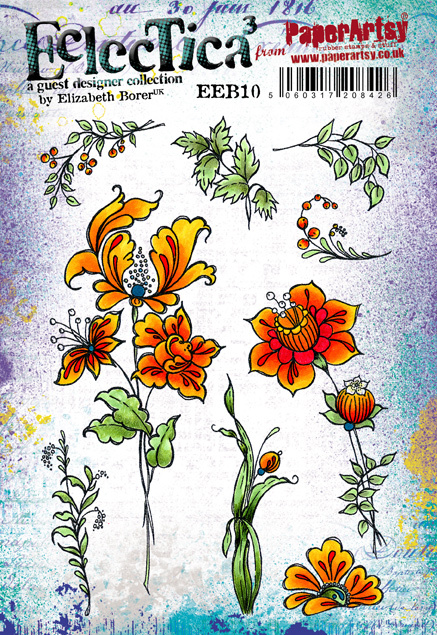 I've hand drawn a range of flowers and extra leafy flourishes to create projects that could be used for simple pieces through to complicated designs. 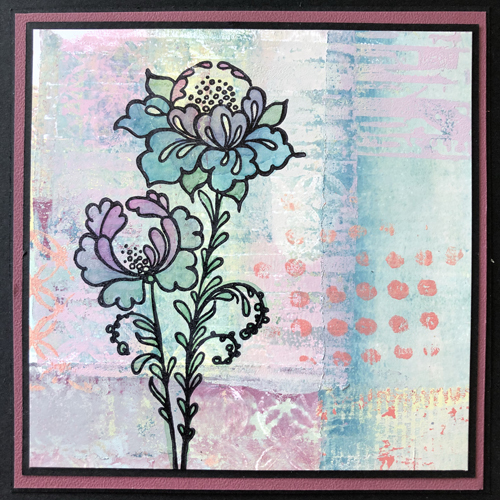 Today I am sharing a few pieces I've made, hopefully to inspire you to try these stamps. Throughout the projects I have used the new PaperArtsy paint colours, namely: Seaglass, Lemon Meringue, Surf's Up, Mustard Pickle, Blah Mange, Pine Grove, Twilight, Vintage Lace, Peach Nectar and Mulled Wine. 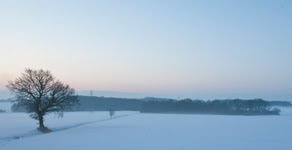 This is kind of three pieces in one! I've made a card with a pocket that holds two tags. 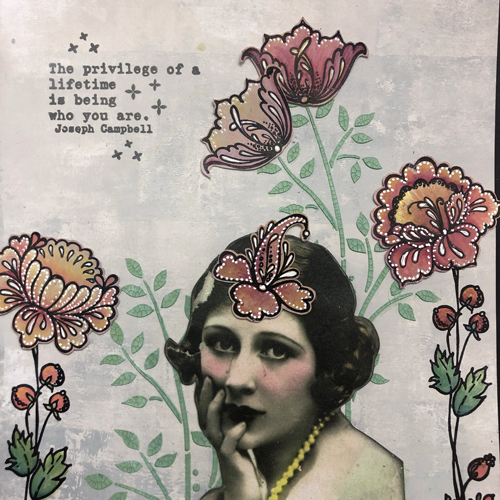 The background of the card is simple painting and stencilling with a few stamped images. However the pocket was a fun to make small piece with just one of the individual flowers on it . When making the tags I used lots of colour to create backgrounds before stamping with smaller images. Finally I stamped the main designs and painted them in bright colours so they really stood out. These flowers are fun to colour because they can be kept very simple or, if you are like me, they can be filled with colour. Here's a close up so you can see the painting strokes I mentioned in the Introduction. Dependning on the opacity of paint you use, it may be that you need to re-draw in some of the stamped lines, or as has been mentioned in other blog posts recently, if you paint your image on a stamping platform, you can easily re-stamp after painting. Lace and ribbon are added as embellishments to the final arrangement. 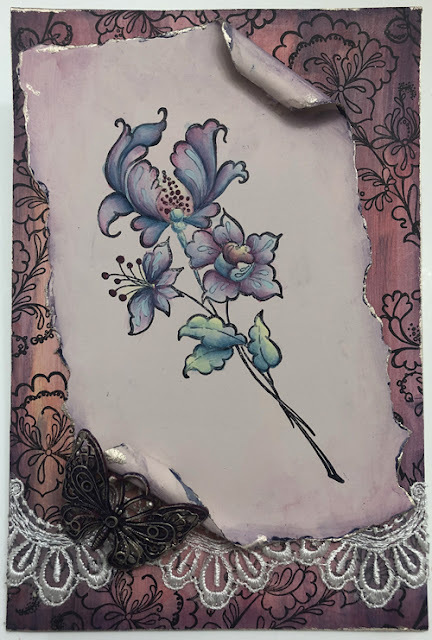 This is a little frame which I decorated with raised area using Grunge Paste through a leaf stencil. The small inner area allows me to use just one flower from the stamp sheet as the focal point. I've stamped, cut out and layered the same flower several times to make it three dimensional. The lovely new paint colours make the flower 'pop' . 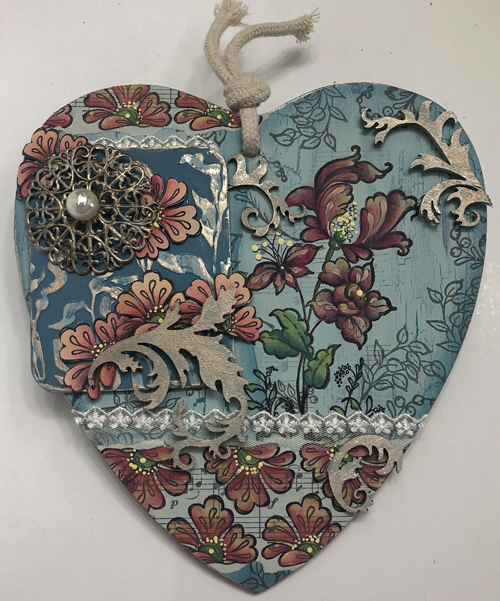 Using the same set of stamps, EEB10, I've created a bright colourful heart that could be displayed as a wall hanging. The largest flower creates a centre piece for the heart. However I've used the sprays to create part of the background. Often I will stamp these in a colour such as watering can archival ink. I also had fun creating a piece of patterned paper by using just one stamp on a piece of music paper. Watered down fresco added the right touch of colour, while still allowing the music to peep through. I've used both sets of stamps to decorate this card. Instead of using the blue range of paints for the background I've reversed the colours and used the red colours. This allowed me to paint the flowers with the blue colours. 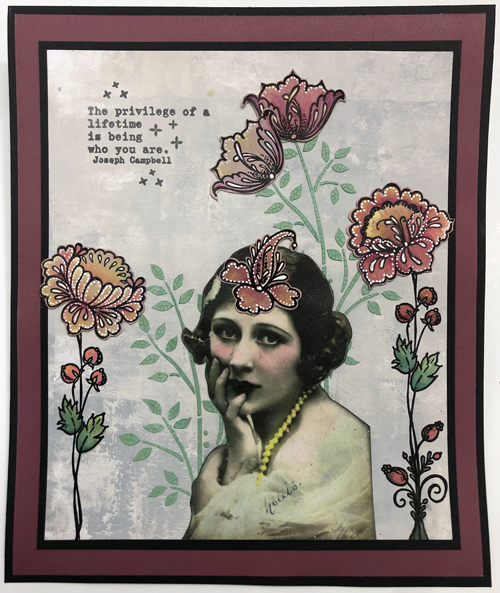 I've used the flowers from EEB09 to create the background by randomly stamping over the painted base, which is a nice simple way of making an individual backdrop for the main image. I've included this card because it combines the stamped image with a form of national folk painting called Khokhloma. This is a Russian form of painting usually done on wooden objects. The base coat is gold and then after the image is stamped on, the background is filled with black paint. This is a very dramatic way of showing off the stamp designs and can be embellished with other colours to create amazingly colourful pieces. 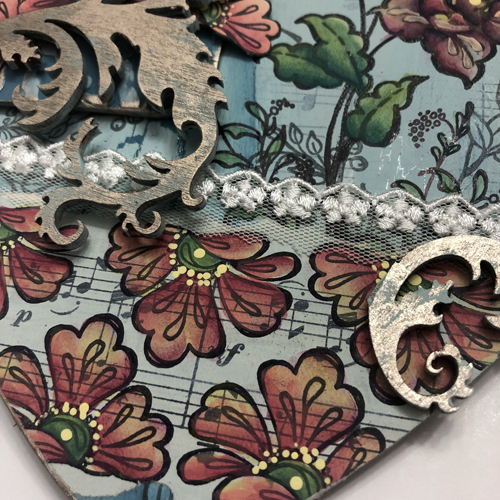 I was itching to have a play with Liz's stamps too, and in addition to the 2 gel-printed samples at the top of the post, I wanted to make something a bit more detailed. The background was brayered with 2 of the new frescos: Eggshell and Koala. Then I tinted some crackle paste with a small dash of green I mixed up from Lemon Meringue and Twilight , and put that through PS061 (Kay Carley). 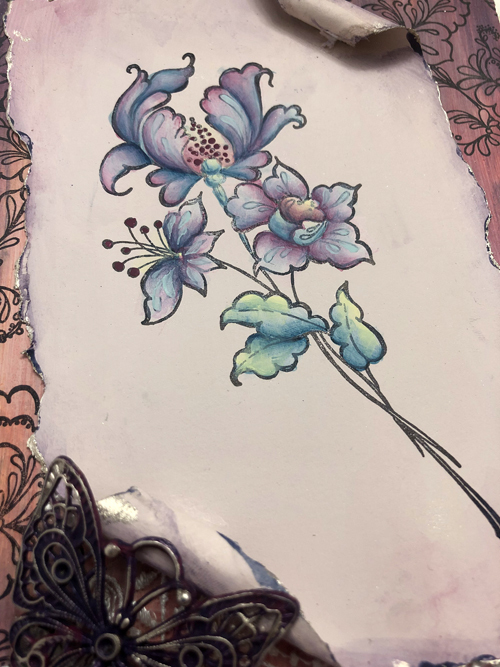 The flowers were stamped, then painted, then over-stamped using a stamping platform so that i didn't have to worry about obliterating the lines too much as I painted. I cut out the flower heads so that I could arrange them onto the stalks in a way that suited. Finally I added some white gel pen highlights. I am fascinated by how Liz managed to create new flowers from all the different combinations, and that is something I must have a go at next! Liz Says: I have not mentioned the fact that in both sets of stamps there are designs that can be used to fill in spaces but can also be used as the stems of individual flowers thus adding to the range of flowers that can be made.I hope that I have inspired you to create some of your own works of art using these new stamps . 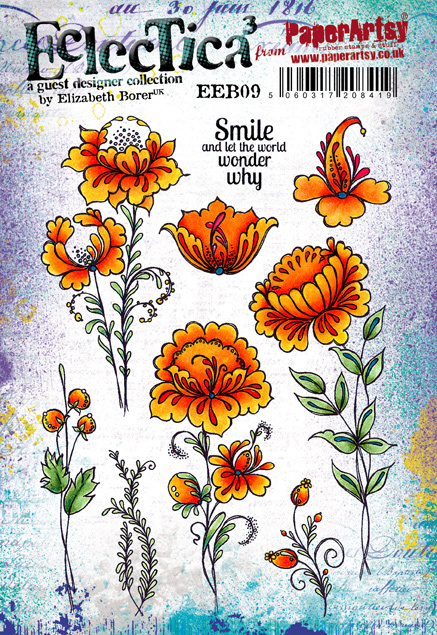 They will be useful for both lovely floral designs and also for much brighter and bolder designs with lots of texture and background effects. Your new designs are so pretty, Liz! fabulous samples as well. Fabulous samples, I get a definite Folk Art vibe from the flowers! Wow! I love both of these sets and the samples all show them off so well! Worth the wait! These are wonderful with a middle eastern flavour that is so different. Love the Folkartsy style of these stamps and amazing projects!! Absolutely LoVE these stamps and the projects are just stunning! These are beautiful! Congratulations on the release Liz!! I love the heart sample, so full of detail! You really painted these well 😍😍😍 and I love the idea of the gold background stamped image then cover in black the rest. It's so striking!! Also, Leandra's sample with the last is just beautiful! Thanks for sharing ladies!! These stamps are great. I love the Gypsy Caravan look of all these beautiful projects. 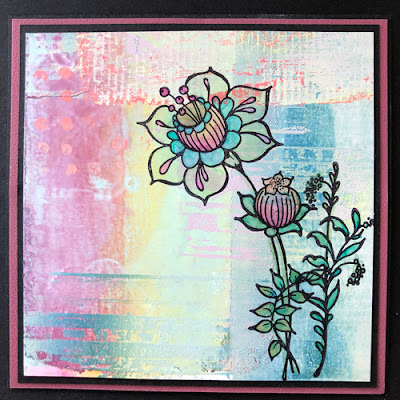 thanks for so much inspiration paper artsy is bursting with it this month!